The Chipmunk Song (Christmas Don’t Be Late), a holiday ditty that people seem to either love or hate with an unbridled passion, went to number one on the Billboard charts on December 28, 1958, and stayed there for three weeks. It was also the only Christmas song to reach the top spot on the Billboard Hot 100 Pop Singles Chart. Aside from the unwashed masses, the song was also a hit with the entertainment establishment, garnering three awards at the 1958 Grammys: Best Comedy Performance, Best Children’s Recording, and Best Engineered Record (non-classical). Not bad for a bunch of rodents. The creator of The Chipmunk Song and the fictitious trio of creatures behind the music was Ross Bagdasarian Sr., also known as Dave Seville. Bagdasarian, who adopted Seville as his stage name, was coming off the heels of his hit single Witch Doctor which hit #1 the previous summer when he wrote the Chipmunk song and gave life to the high-pitched squeaky vocal stylings of Alvin, Simon and Theodore (named after record executives Simon Waronker, Ted Keep, and Alvin Bennett). The song set the tone for Chipmunk shenanigans for decades to come (his son Ross Jr. took over after his death in 1972.) Dave asks the Chipmunks if they’re ready to perform. The forever-conformist Simon and Theodore answer in the affirmative while that rebel Alvin is mentally orbiting Pluto as usual, prompting Seville to bellow, “ALVIN!” who replies, “OKAY!” The show finally gets on the road so to speak, and Alvin manages to get in a request for a hula-hoop, the big fad toy of 1958. When the movie Alvin and the Chipmunks starring Jason Lee as Dave Seville was released in 2007, “The Chipmunk Song” made a comeback. 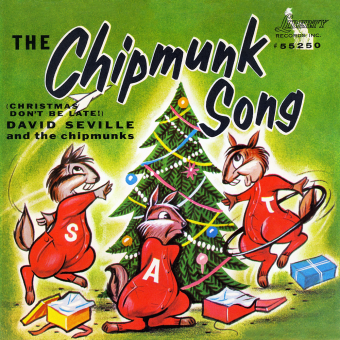 A remixed version that appeared on the movie’s soundtrack, The Chipmunk Song (Christmas Don’t Be Late) (2007 Version), topped out at #66 on Billboard. Combined with the original version, the song is one of the most downloaded Christmas digital singles in history. Love it or hate it, Alvin and the Chipmunks’ perennial Christmas favorite (and yes, Alvin pulled a Diana Ross and got himself top billing) isn’t going anywhere anytime soon. Les Paul claimed that it was he who came up with the idea of speeding up the elder Bagdasarian’s voice when the two met at a party, and the latter asked for ideas about “how do you make a voice sound like a chipmunk?” Paul was a very experienced hand with the tape recorder, and all the goofy things you could do with it, and always took the credit for the creation of the Chipmunks voices!